I had a chance to go to the Seahawks-Rams game on Sunday. Walking across town, I joined the flood of 12s converging downtown and gathering momentum like a glacier-fed river as we passed through Pioneer Square where the bars were hopping. The beer was flowing, too. A few folks were wearing Rams gear, but it wasn’t as bad as last year’s game against the Philadelphia Eagles. Philly fans were louder, more obnoxious, and deserving of praise for the dedication to fly across country. Rams fans seemed much more low key — California mellow. We beat the Eagles, but lost narrowly to the Rams. Many of us were wearing jerseys, and I was struck by the names on the back of lots of them. Among men and women there was an abundance of blue shirts with names like Sherman, Thomas and Chancellor. These were all major stars on last year’s Seahawks — Richard Sherman, Earl Thomas, Kam Chancellor — and critical parts of the team’s legendary Legion of Boom defense that took us to a national championship and brought us within a wisp of second. It was like a walk among ghosts. None of the three plays for the Hawks now. Sherman is in San Francisco, Kam and Earl are lost to major injuries. Thomas just last week suffered a season ender to which he responded by giving the franchise the finger as he was taken off the field. 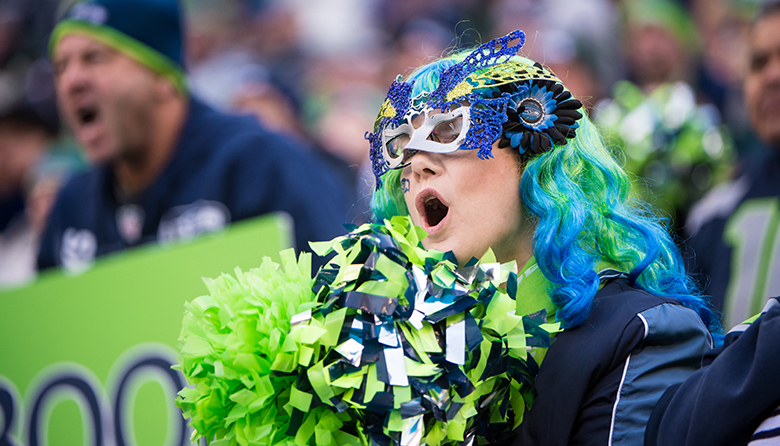 Many fans wear old-school jerseys with the names of golden age Seahawks of the founding era. Jim Zorn and Steve Largent, for example. But Sherman, Thomas, Chancellor — these are fresh memories, here one day, gone the next. And with them most hope for a Super Bowl season this year, though there are hopes as new players try to fill their shoes. NFL football is such an ephemeral sport for one played by such physically huge and often larger-than-life players. It’s a brutal game, both in business and to the body. It’s a thrill to watch men — so far, they are all men — do things few people in the world can do. The roughness and toughness required are part of the appeal. But there are casualties. Games feature elements that are like memorials: Names in a “Ring of Honor” are put up in the stadium; banners hang, like regimental battle flags, marking major victories. The military marches and recruits. Old veterans come to be honored on the Jumbotrons. During the “Star-Spangled Banner,” red rockets are fired at the appropriate moment in a nod to the battle the anthem memorializes. The halftime show featured the fight against cancer, and the Hawks’ owner, Paul Allen, is fighting it himself at this very moment. In such a violent game, the sense of mortality always hovers. Old players are called veterans, and many suffer lifelong injuries. They pass in and out as business and physical health allow. They become heroes but also inevitably become memories at a young age — they play for maybe eight years; they’re mostly retired by 30. They are well paid but make huge sacrifices for our entertainment. The mostly blue (though some white, gray and green) jerseys are part scrapbook, part homage, part statement of personal preference. They are a kind of spectator cosplay that nods to times, passions and passing heroes that will always be with us fans.